Continuing our coverage of the Galaxy S5 includes a ton of tutorials and How to’s for the device. 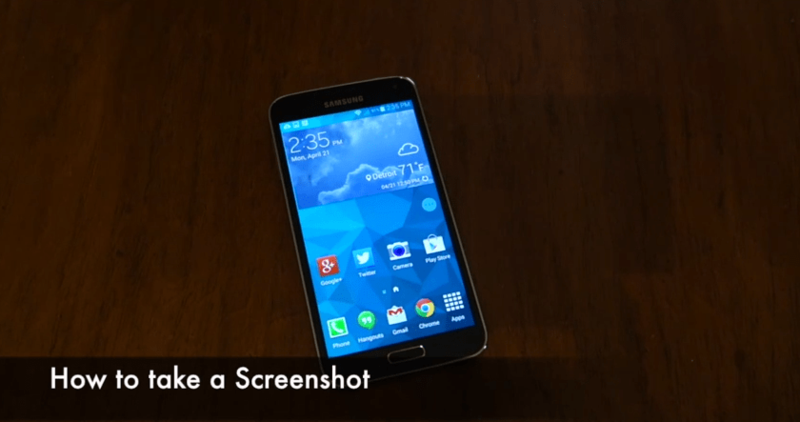 Which today we are showing you how to take a screenshot on the Samsung Galaxy S5. This might seem like a beginner type task, and it is, but don’t forget that we have new users coming over to Android and to the Samsung Galaxy S5 everyday, and they probably don’t know how to do simple things like take a screenshot or enable the mobile hotspot. There are two ways to take screenshots on the Samsung Galaxy S5. The first way, and most common way, is to use the Home button and Power button together to capture the screen. Or you can use your palm and swipe across the screen – as shown in the video down below. Now you’ll see a notification in your notification shade that says that the screenshot was saved. From there you can either delete, edit or share the screenshot. Sharing it is pretty easy too. Just hit the share button and then choose your favorite place to share that screenshot. That includes Facebook, Twitter, Google+, Instagram and everything in between. There’s lots more Samsung Galaxy S5 content on the way, so make sure you stay tuned if you’ve just picked up a brand new Galaxy S5. If you have, be sure to let us know in the comments down below how you’re liking the device. The post Android How to: Take a Screenshot on the Samsung Galaxy S5 appeared first on AndroidHeadlines.com |.